Collect, analyze, and disseminate independent and impartial energy information to promote sound policymaking, efficient markets, and public understanding of energy and its interaction with the economy and the environment. The U.S. Energy Information Administration (EIA) is the statistical and analytical agency within the U.S. Department of Energy (DOE). EIA conducts a wide range of data collection, analysis, forecasting, and dissemination activities to ensure that its customers, including Congress, federal and state government, the private sector, the broader public, and the media, have ready access to timely, reliable, and relevant energy information. EIA is the nation's premier source of energy information and, by law, its data, analyses, and forecasts are independent of approval by any other officer or employee of the United States Government. EIA's information is essential to inform a wide range of energy-related decisions, including utilization strategies; availability of energy sources; business and personal investment decisions; policy development; and responses to disruptions and other shocks affecting the energy sector. As the energy industry becomes increasingly more complex and interrelated, EIA continues to evolve its program to present a comprehensive picture of the energy marketplace to an expanding customer base. EIA's program directly supports Goal 1 (Science and Energy) of DOE's 2014 Strategic Plan. Specifically, EIA has identified four strategic goals that will enable it to contribute to the Department’s mission in a meaningful way. It is essential that we continuously strive to improve our data collection and management processes, since this encompasses EIA's largest operational area. By adopting best practices with regard to our business processes, employing common, maintainable IT systems and platforms, and incorporating smarter ways of using third-party data, EIA can better fulfill its role as the nation's premier source of energy information while also serving as a model of operational efficiency. A key part of our mission is to bring context and meaning to the information we convey. To do this, we must modernize our core modeling tools to improve our energy outlooks and increase the availability of resources for analyses beyond our current products. We live in a real-time world, and to remain relevant EIA must ensure that its customers have access to critical information how and when they need it. We need to carefully consider the way we disseminate our data and analysis and leverage technology to meet evolving customer needs. Our ultimate success rests on the effectiveness of our people. EIA must hire and motivate the best and brightest, give them the technological and developmental tools they need to grow and succeed, and maintain an environment of openness and collaboration so that they will want to stay. 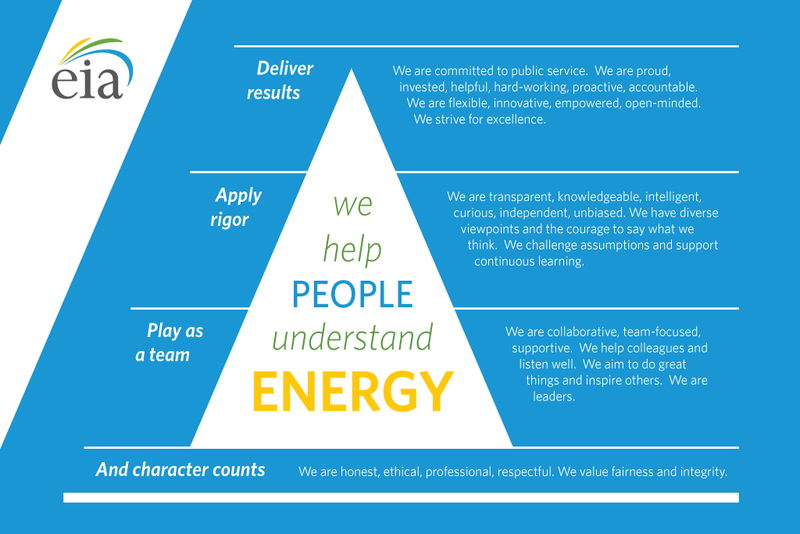 We help people understand energy. We are committed to public service. We are proud, invested, helpful, hard-working, proactive, accountable. We are flexible, innovative, empowered, open-minded. We strive for excellence. We are transparent, knowledgeable, intelligent, curious, independent, unbiased. We have diverse viewpoints and the courage to say what we think. We challenge assumptions and support continuous learning. We are collaborative, team-focused, supportive. We help colleagues and listed well. We aim to do great things and inspire others. We are leaders. We are honest, ethical, professional, respectful. We value fairness and integrity.